Airport Metals (Australia) offers steel & metal bar products in a wide range of compositions and sizes. Browse our stock list today. Make the right choice for your business. At Airport Metals (Australia), we pride ourselves on offering one of the largest collections of metal bars in the country, making it simple for businesses of every size to meet their needs and achieve their goals. 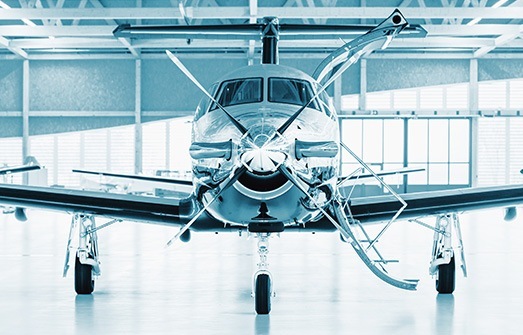 With more than five decades of experience in the sourcing and supply of quality metal goods to companies across the aerospace, defence, aviation and motorsports, you can count on us to supply you with the superior products and knowledgeable advice necessary to help you succeed. Our expansive Tullamarine facility is kept well stocked with an extensive range of stainless steel, aluminium and titanium bars in a range of shapes, compositions, finishes and diameters, all capable of being cut to your preferred length. This allows us to help your business meet even the strictest project deadlines, helping you increase the efficiency of your operations and better serve your clients. Where you require something specific or uncommon for your project, we can leverage our relationship with our parent company Reliance Steel & Aluminium Co to give you access to more than 100,000 metal products. Talk to us to learn how we could support you. Materials your business needs to succeed. 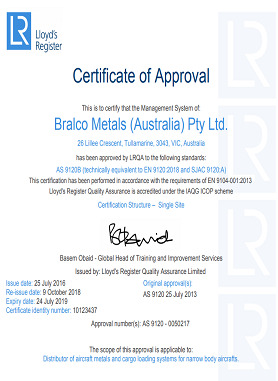 Airport Metals (Australia) is certified AS9120A (in accordance with the requirements of EN 9104-001:2013) and ISO 9001:2008 as a distributor of aircraft metals and cargo loading systems for narrow body aircraft. Working with businesses in some of the most challenging industries in the country for more than half a century has given us an appreciation of the importance of quality and reliability. 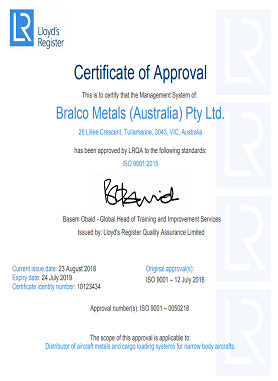 When you buy from Airport Metals (Australia), you can do so with confidence, knowing that you’re choosing a supplier who offers only the best possible products on the market. When your project calls for the utmost in precision and consistency, turn to us. As part of our dedication to support businesses across Australia and Oceania, Airport Metals (Australia) provides our products at some of the most competitive prices in the industry. With a strong, stable supply chain and a dedication to customer service, we’re able to help your business achieve significant cost savings without compromising on the quality of metal products. Start a conversation with Airport Metals (Australia) today to find out how we could support the operation of your business. Contact us today on +61 3 9310 5566 or request a quote through our contact form and one of our experienced staff members will be ready to answer any questions you may have. Make the smart choice for your company and partner with Airport Metals (Australia) today.